Kids often find themselves owning a guitar after receiving it as a gift or getting one for themselves and don’t really know exactly where to start when it comes to putting chords together into a song, it can sometimes become frustrating and we would like to avoid any incidents like the one in the picture….oh no! Parents who want to encourage a musical ability in their children may want to consider getting accustomed to some of the basics so that they can help their kids or even to learn alongside them creating a fun family activity in the process. You can encounter the tablature of the melodies that are played on one string, and it’s great to learn simplistic melodies this way, as it will enhance picking accuracy and speed over time if using a plectrum on a steel string acoustic guitar. Otherwise, the easiest way to get started on guitar is to learn chord sequences and strum them either with your hands and fingers or with a pick. This also makes a great homeschooling music lesson plan! Don’t Worry if it Gets Tough! Sometimes you’ll find yourself or your child getting annoyed, maybe you are finding a particular chord, technique or song challenging, remember to communicate, give each other hints and tips so that you’re always on the same page. 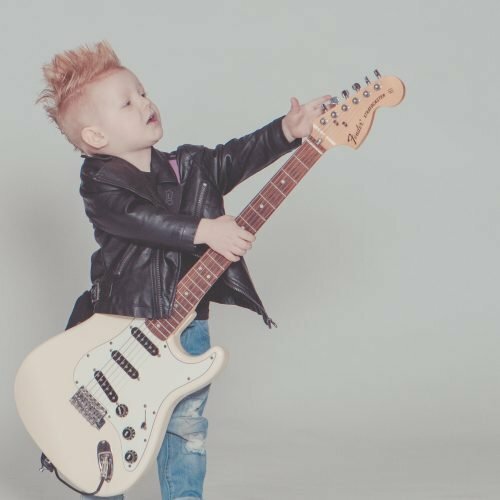 Pain in the fingers is the beginner guitarists biggest woe no matter what their age and when yours or your child’s fingers start to hurt, give the guitar a break for a day or two and then get back into your daily practice until a break is needed again. Before moving to onto learning beginners songs, it’s important to feel comfortable with the instrument first and also know roughly the major chords for example: A, C, G, D and even their variations such as Am or C7th to name a couple which are really simple but vital guitar chords for kids to learn. You don’t have to practice the chords on their own if you don’t want to if you find it more comfortable to go right ahead and use them in the songs then I would greatly encourage doing so. For beginner guitarists building up speed between changing chords whilst accurately hitting the correct strings to keep up with the rhythm of the song will lead experimentations with different strumming patterns and be able to fit different strumming patterns into songs. Use all of the time you and your child needs to get a hang of the chords and the pressure required to maintain the chord shape, have plenty of breaks when fingertips start to hurt and remember to end every practice session on a good note. If your child feels progress is being made by ending on achievements, they’ll be more inclined to practice more. Expanding their skills will come more naturally this way and result in your kid reaching intermediate guitar techniques and songs. Three Little Birds is so simplistic to learn how to play the song could be renamed “three easy chords” as it’s broken down into just three: A, D and E.
The advantage of learning this song is you can play at as slow a tempo as you like for it to still sound like the song and it really allows you to get a grip of changing between those chords and getting the right sound out of them. If your kid gets this song under their belt they could also try their hand at singing whilst playing along, which is also a skill that’s very much worth practicing. You can use different techniques of playing this song; four downstrokes per chord on the verse and eight per chord on the chorus is the essential way but try to mimic the reggae sound by palm muting the strings, you’ll find this also can simultaneously add a nice percussion effect. Another awesome song with just three major chords to remember, and is repetitive enough for solid practice in rhythmic strumming patterns and fluent chord progression. Elvis Presley is certainly the king of rock ‘n roll and with just a bit of work on timing and concentration your child will be rocking out to this fun to play hit in no time. Parents who are Beatles fans I would expect would be thrilled to play along to Love Me Do with their kid as this chilled out, smash hit is super easy to learn; another three-chord wonder song that’s best for beginners. Mastering the chord sequence can be a little bit difficult when sometimes you’re not sure in the moment how long you are holding the E chord, but take your time, listen to the song and practice your timing. Ever thought to play the guitar and harmonica simultaneously to this song? Once you get more advanced with the guitar, it’s easy to find a harmonica neck holder to accompany your guitar playing and trust me, it sounds amazing! The last song on this guide featuring the same three chords of A, D, and E (with the exception of all strings open) as the list of songs with this combination of chords is virtually endless. Wild Thing is a funny and entertaining song for a kid to learn to play, it will also give them more control over the timing and can experiment with strumming patterns. Now here’s a funky jam for beginner guitarists, once they’re able to play this fun tune, you won’t be able to get it out your head but is highly enjoyable nonetheless. You may have noticed it getting a bit more challenging now with the addition of the C and G chord, however, the chord sequence is easy to remember and can be practiced over and over on a loop. It’s not only really fun to learn but it’s such a great song for parties as it really gets people singing, dancing and laughing along. Brown Eyed Girl is a really rewarding tune to learn to play, and even more so if you have a good voice while you play. It may have a tricky picking section as part of the intro which you could save learning until later, but I’mm sure you can easily find some tabs for it. After the tricky intro, the chord progression is jumping between G, C and D quite quickly and so take time with this song, it helps to hum or sing the lyrics at the same time to get a grip on how the chords change alongside the vocals. A nostalgic pop song from the nineties, What’s Up has another chord progression which can be looped over and over if you want to get the practice on changing between these chords. The rhythm in the strumming pattern can easily get confusing when switching from that G chord to the A minor which is something to keep an eye on; if you do find yourself or your kid making this mistake, relisten to the song and remember how the chords change with the vocals. The final song of this guide adds a bit of challenge revolving around the G chord and “walking the bass” when changing between its variations. This features the four-fingered variation of the G chord which once mastered, this song sounds wonderful and romantic when sung along to. Mombible.com is a participant in the Amazon Services LLC Associates Program, an affiliate advertising program designed to provide a means for us to earn fees by linking to Amazon.com and affiliated sites. All information found on MomBible.com is intended for informational and educational purposes only. The information provided on this website is not intended to be a replacement or substitute for professional medical advice. © 2019 Mom Bible. All rights reserved.